Collect artifacts and treasures while mining through the odd world of the cemetery. Your aim is to collect precious treasures buried deep underneath old cemetery. Valuable gold rocks are stashed in chests throughout the cemetery. You can push the chests down open shafts to break them and expose glimmering gold inside. To advance to more challenging parts of the cemetery you must scoop up all treasures! Use arrow keys to maneuver through the cementary following the old shafts and tunnelling new paths. Zombies are not too bright. By pushing the heavy chests down the long shafts the zombies are crushed under the weight of bursing chest. Don't forget to scoop up the gold when chest breaks. Beware - the are some rumors about zombies who can burrow through the mine to kill you! If you want to play Tomb Digger games online you have come to the right place! GamesLoon adds new Tomb Digger games every week. This is your game portal where you can find the biggest collection of free Tomb Digger games online. 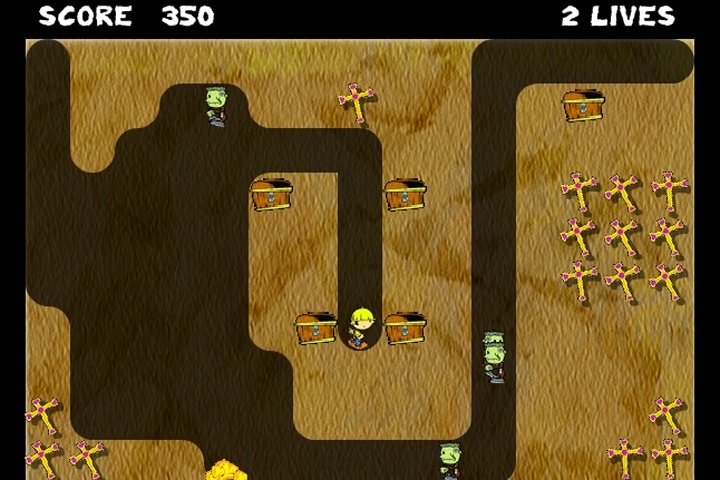 Do not forget to rate our Tomb Digger free online games while playing!